It's pure coincidence two of Margaret Atwood's most notable novels have been turned into TV productions in the same year, but fans have noted that The Handmaid's Tale and Alias Grace are as pertinent now as ever. It's pure coincidence two of Margaret Atwood's most celebrated novels have been adapted for television in the same year. After The Handmaid's Tale, which is vying for a raft of Emmys on Sunday, comes the miniseries Alias Grace. 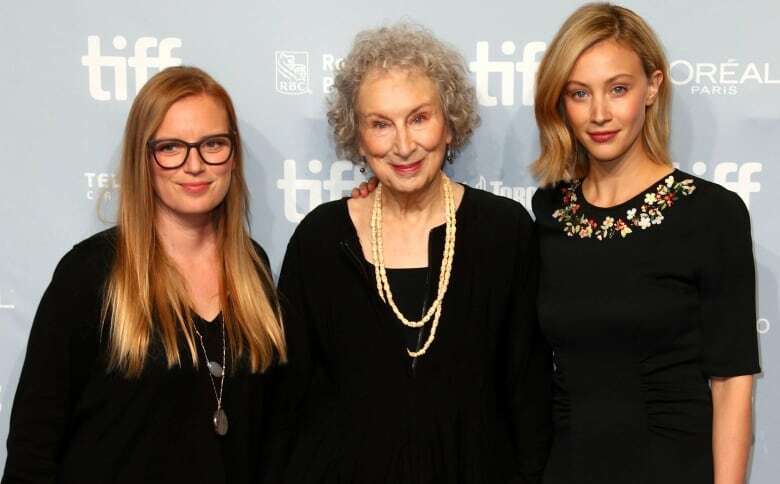 Written and produced by Canadian filmmaker Sarah Polley, Alias Grace is being featured at the Toronto International Film Festival Thursday evening, ahead of its upcoming debut on CBC-TV and Netflix. "Sarah wanted to do this thing since she was 17. And the showrunner of The Handmaid's Tale wanted to make it since he was 19," Atwood revealed on Wednesday, during a live chat with CBC News. "I guess we had to wait for them to be old enough to actually do it." It's a fitting time for both, with the two tales taking on renewed relevance in today's political climate and fans noting they are as pertinent now as ever. If The Handmaid's Tale is a cautionary fable of where things could go, Alias Grace shows how far women have come, according to Polley, who believes we are in a space in between the two stories right now. "I think it's a really important conversation to have, not just out loud and with each other and articulately, but lingering in the background of our mind and hopefully reached more deeply, the way narrative art can reach you," Polley said Tuesday at a TIFF press conference for the project. "These are pressing questions and I'm really glad that these things of Margaret's are out into the world in this way." Atwood had kind words in return, calling Polley's adaptation "very powerful" and admitting that after watching the forthcoming series, she had trouble sleeping. "It gave me horrible nightmares, I have to say. It's very powerful," Atwood told CBC News. "I don't mean nightmares when you're awake — Handmaid's Tale gave me those. When I was asleep, [the Alias Grace miniseries] gave me nightmares ... my own thing." "It's where we've come from, at a time when we are re-examining — and we should be re-examining — things like immigration," she told CBC News on Wednesday, "how we are treating immigrants coming to Canada and what are the things that we should be changing and aware of … for women and where we are at right now with women." Gadon's role is a daunting one: she portrays Marks from age 16 to 40, as the character struggles with an identity crisis and people's changing perceptions and expectations of her. "Playing such a complicated character is a huge gift from Sarah and Margaret," said the Toronto actress, calling the role the most challenging she's ever taken on. It was that complexity that inspired Polley to adapt Atwood's novel — which was shortlisted for the Booker Prize and won the Giller in 1996 — in the first place. "I kept reading it over and over thinking I would arrive at some answer. And that answer never came," said Polley, the former child star who evolved into a respected actress and, now, one of the country's most prominent filmmakers. "I just couldn't get it out of my head. I thought it was the most fascinating book I've ever read." Polley said she hopes viewers will find the series a thought-provoking look at a moment of Canadian history. "It's really important to look back [to] where we came from, especially in this moment where our rights are precarious and the world as we know it is very precarious and the things that have been so hard fought and hard won are precarious." The six-part miniseries Alias Grace debuts on CBC-TV Sept. 25 and will be streamed around the globe by Netflix on Nov. 3.